This easy to use personal dashboard allows you to add and make changes to your employer profile, manage and view claims and set up Pre-Authorized Debit to allow easy paperless payment of your claim invoices. If you are a self-employed individual with no employees or the Administrator of the plan, you will have access to set up your personal Eft information (electronic transfers) for reimbursements and submit your claims all in one dashboard! 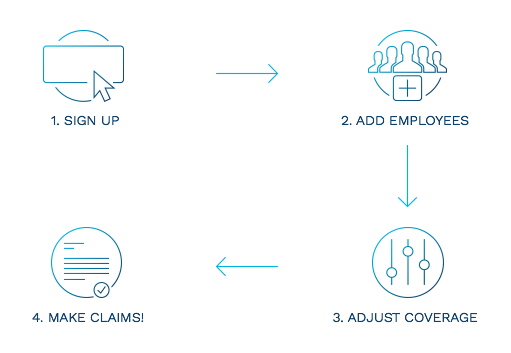 A Secure, Quick and Simple claim process, because your time is valuable. Step 1 – Employee incurs a Medical Expense and pays the provider personally, obtaining a receipt. Step 2 – The employee logs in to their personal dashboard and adds a new claim by attaching images of Medical Expense Receipts and Submits claim to HealthPlus to ensure receipt eligibility. Step 4 – Employer submits claim invoice payment via company cheque or though Pre-Authorized Debit. Step 5 – Once claim invoice payment has been received. HealthPlus remits the non-taxable reimbursement back to the employee. Step 6 – The Employer deducts the expenses paid to HealthPlus as an operating expense.